I made my mom’s famous meatloaf recipe last night and I wanted to pair it with something different than the mashed potatoes I usually serve it with. A few months ago we purchased an ActiFry machine and I’ve been addicted to fried potatoes! I love the ActiFry because it uses a tablespoon of oil or less for each meal so it’s so much healthier than a traditional deep fryer. So many people have told me that chicken wings are great in it too but I’m not a fan of chicken wings. My husband sure is though so I’ll have to try it one day. My latest invention in the ActiFry are Garlic Ranch Potatoes and they are so good! You know the chunky hashbrowns you can order at restaurants instead of the typical shredded ones? Well these taste like those except they are coated with garlic and ranch seasoning. Sounds delicious, right? 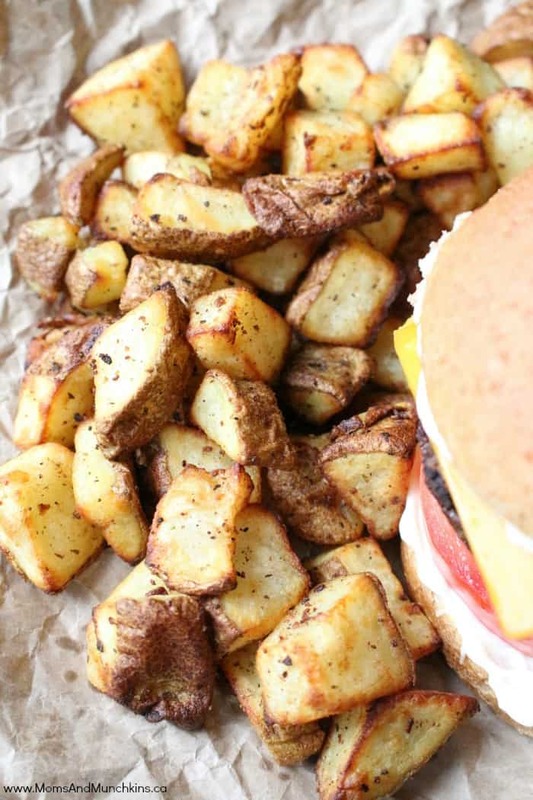 You can make these potatoes without an ActiFry as well. Simply bake them in the oven for about 40 minutes at 425F. Cut the potatoes into bite sized chunks. Put them in a large plastic food storage bag and add oil. Seal bag and shake potatoes to coat well. Add garlic and ranch seasoning, seal bag and shake well to evenly coat potatoes. Pour bag into ActiFry and bake for 30 minutes. Such an easy recipe and packed full of so much flavor! While they are cooking, they do give off a strong garlic smell but when they are baked the flavor is just right. For more delicious recipe ideas, visit our Family Meals & Party Food page. We’re always adding new & tasty ideas. Stay updated on the latest by following us on Facebook, Twitter, Pinterest, Google + and Bloglovin’. Yes, this does sound delicious and I bet it was a hit with the meatloaf! Pinned and tweeted! Thank you Cheryl for linking up with us for Brag About It!